Comcast (CMCSA), the nation's largest cable company, filed documents with the federal government Thursday arguing that its proposed merger with storied entertainment giant NBC Universal will benefit the public. But that claim was immediately denounced by critics, including one consumer advocacy group that called the cable giant's argument "positively Orwellian. "Under the terms of the deal, Comcast would buy a controlling stake in NBC Universal from GE (GE), the industrial conglomerate, in a transaction that would value the new entity, which will keep the NBC Universal name, at $30 billion. If successful, the pact would be a spectacular coup for Comcast and would move it closer to the elusive "holy grail" of a unified content and distribution powerhouse. "The transaction is pro-consumer, pro-competition, and strongly in the public interest," Comcast Senior Vice President David L. Cohen said in a statement. In the filing, Comcast described the public interest benefits of the merger as "substantial" and said it achieved several of the Federal Communication Commission's goals including "diversity, localism, competition, and innovation." Critics fear the merger puts too much power in the hands of a single media company. They point to Comcast's recent customer-service problems and scuffles with regulators as evidence the new entity won't be consumer-friendly. They also worry that Comcast could use its market power to deny NBC content from nascent Internet video companies. Comcast's 136-page "Public Interest Statement," filed with the FCC Thursday, is a forceful step intended to burnish its public reputation and gain the upper hand in the coming public relations battle over the NBC Universal deal. The company said the deal won't be antitcompetitive because Comcast and NBC Universal currently operate in separate, highly competitive markets. 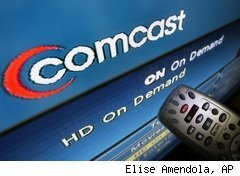 Comcast boasts 24 million cable customers and 16 million broadband Internet subscribers, and owns the E! Entertainment cable channel and the Golf Channel. NBC Universal owns the famous NBC network, Telemundo, 26 local TV stations, as well as CNBC, Bravo and Oxygen. "Through expanded access to outlets, increased investment in outlets, and lower costs, the new venture will be able to increase the amount, quality, variety, and availability of content more than either company could on its own, thus promoting diversity," Comcast said. But critics lambasted the company's claim of a public interest benefit. "Comcast's claims that this merger will benefit consumers are positively Orwellian," said Josh Silver, Executive Director of Free Press, a consumer interest group. "The company gives little evidence beyond assertions that this merger will produce anything other than job cuts, higher cable bills, fewer independent programmers, and a retreat from public service media." Silver added: "Comcast's reputation for customer service ranks about one rung above Enron and Blackwater. The idea that it is magically going to be consumer friendly after it gets bigger doesn't pass the laugh test. Regulators at FCC and the Department of Justice should cut through the rhetoric and put a spotlight on the real problems with this kind of unprecedented media consolidation." Cohen portrayed the entertainment market as highly competitive and said the new company will rank as fourth largest owner of national cable networks, behind Disney/ABC, Time Warner (TWX), and Viacom (VIA). "In the content market, Comcast today has just a 3% share, and NBCU only 9%, so the new NBCU accounts for only about 12% of overall national cable network advertising and affiliate revenues," he said. In arguing that the deal would not harm competition -- and indeed will enhance it -- Comcast is hoping the Commission will approve the deal without imposing any conditions. Public Knowledge, a D.C.-based Internet rights group, zeroed in on a sentence on page 100 of the filing in which Comcast said it would be "inappropriate" for the FCC to impose any conditions on the deal which would require the company to provide access for online video competitors. In particular, Public Knowledge is concerned what Comcast could restrict NBC Universal's vast stable of content to its own Internet-distribution channel, cutting off new online competitors like Vuze from access to that content. In its filing, Comcast basically dismissed the online video business model and said that even if such a model were to emerge, the market would be competitive. "We are incredulous that Comcast and NBCU would downplay Internet distribution of video at a time when the FCC has repeatedly identified online video as one of the primary drivers to broadband adoption," said Harold Feld, legal director of Public Knowledge. "When the Commission considers any conditions to this transaction, it must take into account both existing online competitors and those the Commission hopes will emerge. The Commission must make certain competitors will have access to Comcast and NBC programming as the online market evolves." In an effort to demonstrate the public interest benefit of the deal, Comcast highlighted 12 "commitments" it announced last month, which it hopes will assuage the concerns of its critics. Specifically, the company said it "remains committed to continuing to provide free over-the-air television" nationwide and said it intends to "preserve and enrich the output of local news, local public affairs, and other public interest programming." The company also said would expand offerings aimed at children and the Hispanic community, as well as strengthen parental controls. Even as the Comcast seeks Justice Deptartment approval for the the merger, in which it would would gain control of NBC Universal's rich content factory, the cable giant remains locked in a rancorous, mutli-year regulatory odyssey with the FCC over network neutrality, the idea that broadband companies must treat content equally. Comcast has challenged the commission's authority to enforce its net neutrality principles, arguing they aren't legally binding. The American Cable Association, a trade group of small and regional cable operators, issued a statement mocking Comcast's "commitments." "Because Comcast and NBCU drafted these public interest commitments on their own, it shouldn't shock anyone that they are totally porous and inadequate," ACA President and CEO Matthew M. Polka said. "One of the commitments calls for Comcast-NBCU to self-apply the FCC's program access rules to its TV stations. This 'commitment' isn't without irony, given that Comcast is asking a federal appeals court to tear up those rules and toss them in the wastebasket."